Did summer really fly by so fast? Nobody had a chance to get bored this year…grandparent visits, bonding with cousins, horse back riding, Disneyland, California Adventures, hiking, bike riding, cupcakes, swimming, cooking, crafting, reading, movies, LA Zoo, Petersen Auto museum, the Getty, California Science Center, Butterfly pavilion, LACMA, 4th of July fireworks, sleepovers (with Kidstir recipes Pizza Friends, Chocolate Lava Love, Cocoa Cow, Quick Pancake Mix), the list goes on! And now, for lots of us, it’s time to start thinking about the beginning of school already. I know some families don’t go back until after Labor Day but we’re starting the school year on August 15! The very good news is that we’ve got a really fun- and handy- kit for August that’s themed all around lunch time. First, we want to encourage everyone to enjoy their last weeks of summer, so get out and have a final family picnic or two! Then, our Sandwich Shop Kit will get the kids involved with lunch prep this year, making the school transition easier for all of us, kids and moms and dads! Get inspired to plan a picnic by reading our Family Picnic Tips! No matter where you picnic (the backyard, the park, or by the sea), eating outside will feel like an adventure! Try our Summer Caprese Sandwiches or Cucumber Sandwiches, Sunny Quinoa Salad, and Tiny Pies for dessert. If you’re feeling extra motivated, make some Homemade Ketchup with fresh, farmer’s market or garden grown tomatoes! When the box arrives, read our post on 5 Lunch Box Ideas. Then tear open your August Sandwich Shop kit! 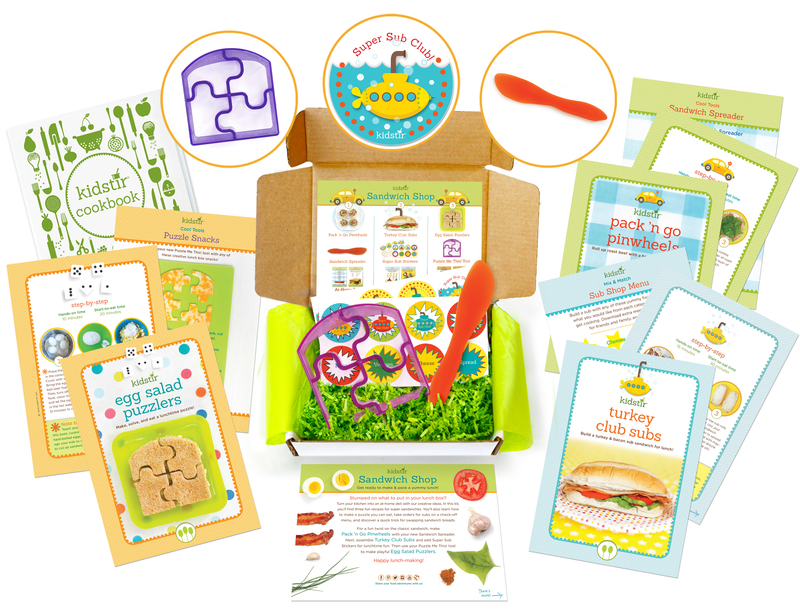 Inside, you’ll find 3 yummy recipes, 2 cooking tools, a special extra fun item and lots of learning and fun! Pack ’n Go Pinwheels. It’s time to declare that all lunches don’t include bread! 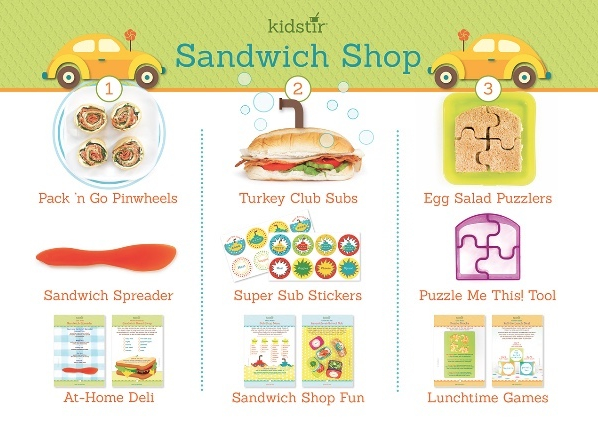 Or said differently, you can put a twist (or a roll) in your sandwich game and make lunch more fun and interesting! In this recipe, your kids will roll up roast beef with a homemade herb spread. Yummy! This recipe is perfect for a family picnic or school lunch. Pssst, I also put these pinwheels out as appetizers for birthday parties and other multi-generational gatherings. They’re popular with all ages, easy to pick up, and fun to eat. When you’re packing up these pinwheels to go, be sure to keep them cool because of their cream cheese filling. We’ve got a Keeping Your Cool Kitchen Tip with great ideas like freezing your yogurt or juice box the night before and using that as the ice pack in your lunch box. Clever! Turkey Club Subs. Sometimes you have to get down to basics, and this recipe does it with style. You are going to build a turkey & bacon sub sandwich for lunch! We teach useful tips like how to make bacon in the oven instead of the stovetop (a much safer, splatter proof method). There’s also a great Lunch Box Shortcut Kitchen Tip on how to do prep on the weekend for the school week’s worth of easy packed lunches. Handy! Pssst. Once the kids have made their sandwiches, you’ll be so proud of them. Sneak in a loving Lunch Box Note and they’ll find a loving surprise when they open up their lunchbox at school. Egg Salad Puzzlers. I love egg salad! This recipe puts all sorts of twists and turns on the classic recipe. Curry powder? Jigsaw puzzle shapes? Avocado? Greek yogurt? Dill? Pickles? Capers? Yes, yes, yes, it is time to elevate the egg salad sandwich and we show you how to do so here! Ready to get even more creative? Play our Roll the Lunch Dice Kitchen Game and let lady luck tell you what you’re having for lunch today! Here’s a Lunch Dice template that you can get going with before your kit even arrives. These three kid-friendly tools and activities will have kids begging to make their own lunch (just the way we like it!)! Sandwich Spreader. With this handy, durable tool at home, you are going to have an At-Home Deli. This Sandwich Spreader Cool Tool is great for spreading, cutting, frosting, and packing up to go. It is also easy to clean for kids and grownups alike! You’re going to find this becoming a tool that everyone in the household goes for day after day. Once you’re a spreading pro, it’s also worth reading the Kitchen Creativity Foodie Page on Sandwich Bread Swaps. There are tons of tips on swapping out bread for rice cakes, flatbread, toast, english muffins, tortillas, crackers, pita bread, bagels, rolls, biscuits and more! Super Sub Stickers. Sandwich Shop Fun! First kick off by having the kids take orders with this Mix n Match Sub Menu. Then after they build the sandwiches, have them add cute stickers for polish and whimsy. Another way to interest kids in making and eating their lunches- who doesn’t want that! Don’t forget to read Lunch Box Tip Foodie Page Assemble-at-School Sub to learn how to build a perfect, fresh (not soggy) sub at school. All your lunch buddies will be begging for a bite! Puzzle Me This Tool. Lunchtime Games are the theme with this tool. An adorable jigsaw shaped cutter will turn your ordinary sandwich into an eggs-tra-ordinary lunch time puzzle game. Kids can cut their sandwich into jigsaw pieces, then take them apart and put them together at school. Plus, it’s so versatile. Cheese, watermelon, tortilla chips, cookie dough- you can turn almost anything into a nifty jigsaw puzzle (Check out foodie page Cool Tool Puzzle Snacks for more ideas)! It’s time to open up your Sandwich Shop! Lunch is served! If you love it, check out our super popular Taco Truck Fun kit, available as a single purchase in our Store (subscription not required, and fabulous as a gift!). You can make a Mexican themed lunch of Guac & Roll, Food Truck Tacos, and Arroz con Leche. Complement with Fresh Homemade Salsa, Healthy Baked Tortilla Chips, and delicious dessert Churro Muffins. Plus, play fun learning and creativity filled games and activities like our Lunch Truck Menu and Lunch Truck Box. Check out more fun ideas on our DIY page. Happy days at the end of summer break and back to school!